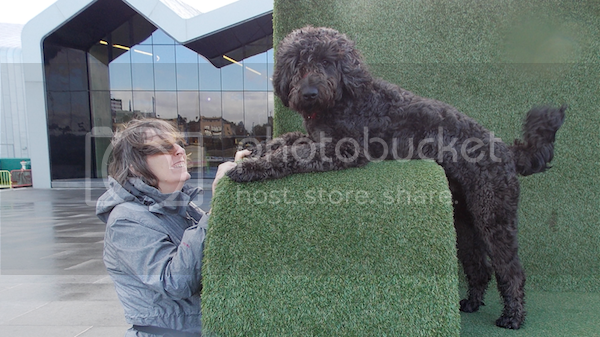 UK Labradoodle Association • View topic - Luna the kleptomaniac! Post subject: Luna the kleptomaniac! Now almost 6 months Luna is EXTREMELY busy stealing items and running off with them - coasters, tv controls, phone, ornaments - in fact anything she can swipe off tables and worktops. Its exhausting! She doesnt chew them but stands just out of reach and then bounds off at speed! She is like a naughty adolescent. She has a new coat appearing and it looks as though it has been crimped, also some new teeth. Despite 3 walks a day she is a whirlwind of energy - but does sleep a good 7 hours at night. We have been battling tear staining which I think is more of a problem due to teething. Has anybody had a doodle who is so mischievous and energetic? Post subject: Re: Luna the kleptomaniac! most of them are!.....Luna is living up to true doodleness...they just can't help it. This too shall pass......in time ! “Ah yes, I remember it well” as the song goes. Holly always and still does lean, she has something she should not have find a wall to lean on with a guilt ridden face and jaw firmly clenched. Mostly stuff from the garden, large chunks of chip bark great for spreading across the carpet, a stone, always good for a biscuit. She had a major op to remove two stones when she was 1 and still plays the “I have a stone in my mouth and I know you will give me a biscuit for it as it is cheaper than another op!! I have watched as 5 humans try to outsmart Holly who has stolen their dogs ball, a splendid game I refuse to participate in, she struts about tempting them at arms reach then shoots off, complete joy on her face. I now carry a spare ball for persistent owners. 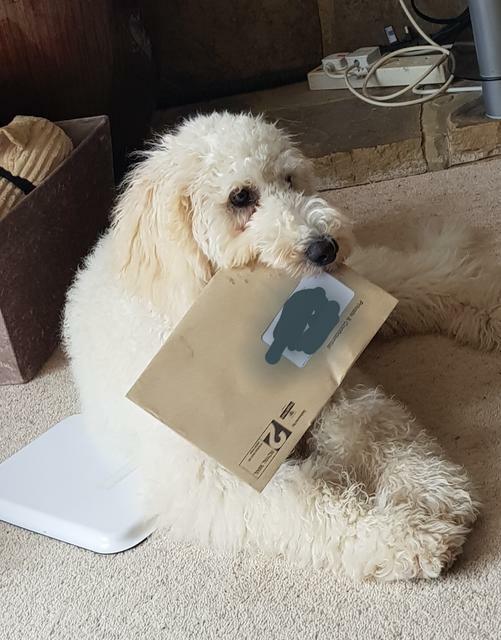 So Luna is doing what comes naturally to doodles, a way to get your attention and maybe have a laugh as we attempt to get the object. She is just lovely....love it when they are mischievous. Re teething ,you can try knotting up old flannels ,soak them and put in the freezer , it helps cool their gums. Holly liked to lick an ice cube, at least those little needle teeth that caused such pain to us are now replaced with blunt exceedingly strong bone crunchers !! Holly stole the OH’s whole round Port Salute cheese as she looked up from leaning on the wall, she smiled the whole orange coloured mouthful at us. I think she was happy though to give it up for a biscuit that did not completely fill her mouth. The OH did not get his cheese and biscuit that night. So funny to hear all your stories! Reassuring too that it's a Doodle thing. My daughter's Doodle is so laid back - always has been. She is 5 and absolutely refuses to have anything to do with Luna, who presents her with every toy she has in an attempt to get her to play. We are all off to Pembrokeshire next week, so I hope she thaws out a bit! Luna is going for her first proper cut tomorrow - not too short, but her coat is getting very long indeed. We can't walk her or take her anywhere without people coming up to her and saying what a beautiful coat she has. Her mother had quite a long coat which fell in ringlets - but Luna is such a dirty little madam that I am constantly brushing bits and pieces out of her coat. The new coat is very crimped indeed. I think she is currently testing us - has to be told several times to do anything, whereas previously she did it instantly. We have a bit of a problem with travelling in the car: she invariably wets a little - even on a short journey, she isn't distressed and likes going out in the car, and won't always empty her bladder before we go out. We have been using puppy pads to line the boot, but I wonder did any of you have a similar problem? Otherwise she is well housetrained and can go quite a long time in between garden visits. I'm hoping it is something she will grow out of - she is so big now (17kg) that we forget she is only five and a half months old.